Mazal Tov on your forthcoming big day, and thank you for considering Oxford Shul as the venue for your marriage. Rest assured that we will do everything we can to make the day meaningful and memorable for you, and as hassle-free as possible. Most Brides and Grooms look forward to their marriage with much anticipation and enthusiasm, but also with a fair amount of stress. There is indeed a lot to do and much to prepare. I always advise Brides and Grooms to spend more time and energy preparing for marriage and less preparing for the wedding day. The information below will relieve you of a lot of the stress and worry associated with marriage. You will find here answers to a lot of commonly asked questions about the correct procedures relating to the marriage ceremony and what you need to do to prepare for it. Read it through carefully, and if there is anything worrying you or about which you are not sure, do not hesitate to contact either myself or the office staff for more information. Closer to the wedding date, we will meet in my office to get better acquainted and to discuss the marriage ceremony in greater detail. If, however, you feel that there is anything you want to discuss with me at an earlier stage, call the office to make an appointment. I look forward to meeting you soon in person and to being part of your special day. Download and fill in the application form and return it to our offices as soon as possible. We will then give you a letter of confirmation that you have booked to get married at Oxford. As soon as you have our letter of confirmation, contact the Johannesburg Beth-Din Marriage Authorisation office at 010-214-2600 for an appointment. We can only finalise your marriage application after the Beth-Din has granted the Authorisation. The Beth Din will notify us in writing once they have authorised the marriage. We will then contact you to come in to our offices in order to sign our Marriage Register and to meet with Rabbi Chaikin. Contact Jewish Marriage Education as well as Jewish Family and Community Council as soon as possible to book the required Marriage Preparation courses. They are often booked up and the sooner you call the more likely you are to get times that will suit you both (see below for more details). 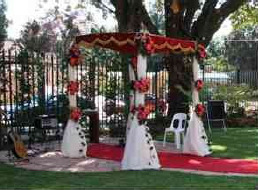 All marriages that take place in Orthodox Shuls in South Africa must be authorised by the Beth Din. To this effect please contact the Beth-Din Marriage Authorisation office as soon as you have made a booking with the Shul. The Johannesburg Beth-Din is located at 55 Garden Road, Orchards. Their telephone number is 010-214-2600. You must make an appointment and a fee will be payable directly to them to process your application. This Birth Certificate has your name and ID number as well as that of both of your parents. This can be obtained from the Department of Home Affairs, but this sometimes takes several weeks. There are also several private agencies that can get the paperwork done quicker, albeit for a higher price. If this is not readily available, as an interim measure, the Beth Din will accept letters from two reliable people or a rabbi testifying that you are the biological child of your parents—the full Birth Certificate can then be submitted at a later stage. You will require a Get Certificate or death certificate in respect of former spouse. If he/she was not Jewish you will have to include an affidavit stating that this is the case and whether he/she was ever converted to Judaism. Please supply the relevant documents. The Beth Din will also require a letter of confirmation that the marriage has been booked in our Shul. Once your Beth Din application has been approved they will notify us. Being married, and remaining married, is a challenge that we all take on without sufficient knowledge of what is involved. All couples getting married in Orthodox Shuls in South Africa are required to take part in a Marriage Education and Preparation process, which equips them with the tools needed to help make the marriage a success. Jewish Marriage Education is provided in a series of individual sessions (4 sessions for Brides, 1-2 for Grooms) by trained couples who have a personal knowledge of Jewish Marriage. These informal and friendly discussions will give you insights into the Marriage ceremony and its spiritual dimensions and help you to understand the beauty and value of the Mikvah. Contact Mrs Lilian Wolpe at 011‑648‑5583 to set up an appointment. Marriage Preparation is provided by the Jewish Family Services. It takes the form of an individual Couple Relationship Review, based on the International “Prepare-Enrich” model. Both of you will meet with a specially trained counsellor for three sessions, at a mutually agreed time, to discuss your relationship’s strengths and growth areas. There is a nominal cost for this course. It is strongly suggested that you book for these courses as soon as possible. As the date of your wedding gets nearer, you will find that you are more stressed and that your time is at a greater premium. To maximise the benefits of these programmes it is best that you enrol now. Under the Chupah the Groom hands the Bride a ring. This ring forms an integral part of the first half of the marriage ceremony (“Betrothal”). The ring must belong to the Groom i.e. you must purchase it yourself with money belonging to you—borrowed rings e.g. parents' or grandparents' rings cannot be used for the ceremony. The ring may be made from gold, platinum or silver but must be plain i.e. no engraving, fancy design or set stones (these may be added afterwards). 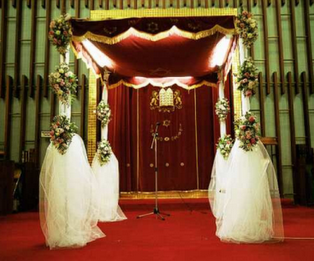 The Shul will provide a standard Ketuba (marriage document) at no extra charge. This is an A4-sized card, with the English and Hebrew writing back to back and is computer generated. If you wish to order a fancier decorated Ketuba you will need to make your own arrangments. Please ensure that the Bride’s dress conforms to the standards of modesty and propriety (“Tzniut”) laid down by Jewish Law. Clothing that is in any way revealing is not appropriate, i.e. sleeveless; bare shoulders, backs, or cleavages; transparent garments; hemlines above the knee. Religious ceremonies may in fact not take place in the presence of inappropriately dressed persons. A departure from these standards is offensive to the Shul and will cause embarrassment to the clergy and all concerned. If in doubt, have a discreet word with the office staff. Please note that all members of the retinue must be Jewish and, if married, within the Jewish faith. Any special cases should be discussed with the rabbi. Also ensure that all dresses conform to the standards of “Tzniut” as outlined above. The wedding reception must be Kosher, i.e. catered by a Beth-Din approved caterer. If you intend inviting rabbis or chazanim (or any other frum people) to the reception, please be aware that they will not be comfortable if there is mixed dancing or a female vocalist performing. It has become customary at many weddings to have separate Israeli-style dancing at the beginning of the reception, up to the main course and bentching. Discuss this with the band in good time. Arrangements for the use of the recently refurbished hall on the Shul premises are made by contacting the Shul office. If you would like other rabbis to be involved in your wedding ceremony, please let the office know. While “Siddur Kiddushin” (the actual performance of the marriage ceremony) can only be done by the Shul’s own rabbi, we will be more than happy to include any recognized Orthodox rabbis as co-officiants in the ceremony. Immersion in the Mikvah by the Bride prior to the Marriage is an integral Halachik component of a Jewish Marriage. It is done on the night before the wedding (although it can be brought forward by a couple of days in case of necessity). Full details will be given during the Marriage Education classes (see page 6). Attendance by the Groom on the morning of his wedding is customary (and recommended) but not obligatory (see page 9). If you so desire, Rabbi Chaikin will guide you in this regard. You will have the opportunity of meeting with Rabbi Chaikin approximately 3-4 weeks before the wedding. The meeting is held during office hours at the Shul, and lasts 45-60 minutes. This will be an opportunity to get acquainted, to discuss the ceremony and any special requirements you may have. You will also sign the Shul’s Marriage Register at that time. If necessary, or if you so desire, a second meeting will take place about 10 days before the wedding. Please contact Cecile at the Shul office (011-646-6020) to organise this appointment. It is customary for the Groom to be called up to the Torah (“Aufruf”) on the Shabbat morning before the marriage takes place. We will be more than happy to accommodate you at Oxford Shul in this regard. If you plan to have your Aufruf at Oxford please let the office know as soon as possible. We will also try to call up family members and close friends whom you nominate to the Torah if there are sufficient Aliyot to be allocated—you will need to give us a list of their Hebrew names and that of their father before that Shabbat. As it is customary for the women to throw sweets at the Groom at the conclusion of his Aliyah, please bring a couple of packets of (Kosher) sweets to Shul before Shabbat. Many families choose to sponsor the Brocha at Shul that Shabbat; arrangements for this should be made with the shul office (011-646-6020). If you paid the non-member’s surcharge for your marriage ceremony, we are pleased to offer you both one year’s free membership (including seats for the High Holidays). Please contact the office prior to Yom Tov to arrange seat allocation. Couples getting married without this contract may be adversely affected under South African law. Speak to your attorney about drawing up a pre-nuptial agreement. As the name indicates, this must be done before the marriage. Changing the status of a marriage at a later date is a costly and difficult process. It is customary for the Bride and Groom to separate from each other’s company one week before the wedding. This is for religious and spiritual reasons, allowing each individual the solitude needed for personal introspection before this special event. There are also sound psychological benefits for this. During the final days tensions mount and we tend to be more irritable than usual; we may just say things we may later regret. The sense of anticipation is also heightened by the separation, making the reunion under the Chupah that much more special (ideally all contact should be avoided, including use of the telephone, email or SMS). The Wedding Day is not just a special day, it is also a sacred day. It is considered a personal Yom Kippur for Groom and Bride; all your sins are forgiven on that day, enabling you to start a new life unburdened by any failings of the past. For this reason it is customary to fast on the wedding day—from daybreak until after the Chupah (the Shul will provide you with tea in the Bridal Room after the ceremony). Just as on Yom Kippur, the purpose of fasting is to encourage repentance, soul-searching and introspection. This is a good day to reflect and meditate on ways in which you can enhance your own relationship as well as your relationship with G-d. Your prayers on this day are also very powerful—use this gift wisely to pray for a happy, healthy marriage. Grooms should make a special effort to attend Shul and to put on Tefilin on the wedding day. It is also customary for Grooms to immerse in the Mikveh on the morning of their marriage. Use the power of Tzedakah as well, on that day, by setting aside funds for the Jewish Charity of your choice. You and your family should be at Shul 30 minutes before the Chupah is scheduled to start. Bride and female members of the retinue should go straight to the Bridal Room. Groom should be seated in the Box right in front of the Bimah, flanked by his father and father-in-law; Best Man and Poleholders should sit in the front row closest the box. If the Chupah is taking place in the garden the Groom’s party should meet in the rabbi’s office (or, if the Groom’s Table is taking place at the Shul, in the upstairs lounge). At this stage the Ketubah will be signed. The Ketubah is the traditional Jewish Marriage contract in which the Groom pledges to support his wife. The Groom will indicate his acceptance of this pledge by lifting an object (usually a handkerchief or yarmulka) in front of two witnesses; the witnesses and the Groom then sign the document. After the Ketubah is signed, the rabbi will lead the Groom and the fathers into the Bridal Room where the Bride is waiting. After ascertaining that the Bride is the right woman, the Groom will bring the veil forward to cover her face. In doing so, he indicates that he is marrying her not just for her external charms, but mainly for her inner qualities. At this stage the rabbi and the parents will bless the Bride. It is traditional for the Bride and Groom to be escorted to the Chupah by a set of Unterfireres (Chaperones) each. Bride and Groom are King and Queen on this special day and should not walk alone. The Unterfieres should be a married couple with children. It is seen as a good omen for the young couple to follow their footsteps and that they should succeed in raising a family. Usually the parents of the Bride and Groom meet these traditional requirements and act in this role. If this is not the case (absent, deceased or divorced parents) the parents who are present accompany the Bride or Groom down the aisle; in addition a married couple (grandparents, uncle and aunt etc.) is invited to act as Unterfirers and walk directly behind the Bride or Groom. According to custom, a pregnant woman should not be an Unterfirer. The Chupah canopy is symbolic of the Jewish Home. The Groom comes under the Chupah first, designating this as his home; then the Bride joins him. She will first circle him seven times, symbolically casting her protective aura and building a spiritual fortress around it; thereafter she will go stand at her Groom’s side. The Bride should have no jewellery on her hands at that point, and her bouquet should be handed to someone else to hold for this part of the ceremony. The ring is placed loosely at the tip of her finger, and pushed up more securely after the above words have been said. From this point on you will be officially married. The rabbi will also address you during this part of the ceremony. At this stage the Ketubah is read out, first in the original Aramaic, then an English abstract. The honour of reading this document may be given to a guest rabbi, if you have invited any to participate in the ceremony. The Ketubah will then be handed to the Groom, who will officially hand it over to the Bride. It is important that you retain this important document in your possession at all times from now on. The second part of the marriage ceremony is called “Nissuin” and consists of seven blessings (“Sheva Brachot”) recited over a cup of wine. Remember once again to answer Amen to each of the Brachot. The Blessings deal with the sanctity of marriage and bless the couple with happiness. If there is chazan and choir present they will intone this, otherwise the rabbi or other invited guests may be given this honour. At the conclusion of the blessings you will each be given to drink, this time by your father-in-law and mother-law respectively. The shammas will now place a glass at the Groom’s feet, and he will be asked to break it. Even at the height of our joy we must remember that the Temple is not yet rebuilt and that Jerusalem is not yet restored to her former glory—breaking the glass is our way of praying for Mashiach and the speedy rebuilding of the Temple and for the end of Exile and national insecurity. After the glass is broken, the Chupah ceremony is completed. You will now proceed to the Bridal Room, where you be given five minutes of complete privacy. This is known as Yichud (togetherness) and puts the final touches on the Halachik side of the wedding. Tea is provided so you can break your fast. This is an island in time; the nerves of the Chupah are over and the tumult of the reception has not yet begun. Enjoy this special moment. The rabbi will knock on the door after the allotted time is up. After Yichud you will both sign the Civil Marriage Register, a copy of which will be sent to the Department of Home Affairs so that your marriage is recognised according to South African law. Two witnesses are required for this, whom you may nominate. It is often the Best Man and Maid of Honour; if you have a non-Jewish friend you would like to involve in your marriage, he or she may act as witness. You will then be given a legal Marriage Certificate. Please note that this is an abridged, short form certificate—should you require a full, unabridged certificate you will have to apply for this at a Home Affairs office. The Bride will also sign the Ketuba at this stage. This concludes all the formalities and you will be handed over to the photographers! Think of the Reception as an extension of the religious ceremony and make an effort to create the atmosphere appropriate for a Yiddishe Simcha. Jewish music and hora dancing help to make it a truly Jewish occasion. The Meal should be started with the blessing over bread, Hamotzi. It is not necessary for a rabbi to make this bracha and it is more appropriate for the Groom to do so (or any other guest whom you wish to honour). At the conclusion of the meal Bentching and Sheva Brachot should be recited. This need not be done by a professional; should you wish to hire a chazan or chorister to do this speak to the office and they will be able to guide you.